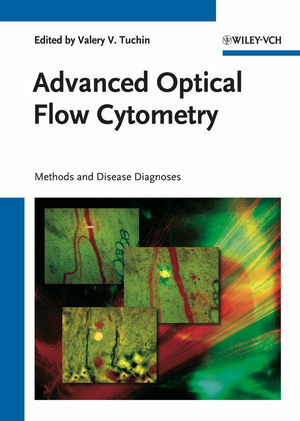 A detailed look at the latest research in non-invasive in vivo cytometry and its applications, with particular emphasis on novel biophotonic methods, disease diagnosis, and monitoring of disease treatment at single cell level in stationary and flow conditions. This book thus covers the spectrum ranging from fundamental interactions between light, cells, vascular tissue, and cell labeling particles, to strategies and opportunities for preclinical and clinical research. General topics include light scattering by cells, fast video microscopy, polarization, laser-scanning, fluorescence, Raman, multi-photon, photothermal, and photoacoustic methods for cellular diagnostics and monitoring of disease treatment in living organisms. Also presented are discussions of advanced methods and techniques of classical flow cytometry. Valery Tuchin is Head of Chair of Optics and Biomedical Physics and Director of Research-Educational Institute of Optics and Biophotonics at Saratov State University. He has authored more than 250 papers and books, including his latest, Tissue Optics. Light Scattering Methods and Instrumentation for Medical Diagnosis (SPIE Tutorial Texts in Optical Engineering, Vol. TT38, 2000; second edition, PM166, 2007), Handbook of Optical Biomedical Diagnostics (SPIE Press, Vol. PM107, 2002), Coherent-Domain Optical Methods for Biomedical Diagnostics, Environmental and Material Science, Kluwer Academic Publishers, Boston, USA, vols. 1 & 2, 2004, Optical Clearing of Tissues and Blood (SPIE Press, Vol. PM154, 2005), and Optical Polarization in Biomedical Applications (co-authors L. Wang and D.A. Zimnyakov; Springer, 2006).